Sonya Kenin captured the USTA Girls National Championships in August and now has an opportunity to add a US Open title to her resume, after the 16-year-old from Florida defeated Fanny Stollar of Hungary 6-4, 7-5 in Saturday's semifinal. 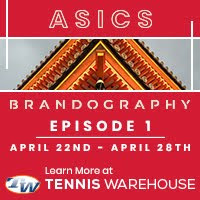 Low clouds and the forecast of rain added urgency to the junior semifinals, with Kenin completing her win less than an hour before play was halted for the day. She saved two set points with Stollar serving for the second set at 5-4; losing either of those two points would have likely resulted in the third set going unfinished or moved indoors on Saturday. "And at 6-5 it was getting cloudy, so I was like, I really want to finish this, I don't want to wait and finish off the match later," said Kenin, the No. 9 seed. Kenin had beaten the 11th-seeded Stollar this spring in the Grade 1 International Spring Championships final in Carson, with Stollar winning a second set tiebreaker after Kenin had held match point. Although Kenin took the third set at love, she knew Stollar could be dangerous. "I know she has a really big serve and she's aggressive and has a good backhand down the line," Kenin said. "She's a really good player, but I'm just so confident right now. I'm playing really good and I'm fighting. I ended the match really well and she couldn't do anything to stop me from playing that well." Kenin's opponent in the final is another Hungarian, No. 2 seed Dalma Galfi, who defeated unseeded Francesca Di Lorenzo 7-5, 7-6(1). Service breaks were rare throughout the match, with Galfi getting an one to open the match but Di Lorenzo pulling even at 2 and staying ahead until a poor service game at 5-all gave Galfi the opportunity to serve out the set. An ace and two winners helped Galfi close it out, disappointing the large Court 11 crowd supporting the American. Di Lorenzo fell behind a break in the second set, but again pulled even and led 5-4, and 6-5, but Galfi held to stay in the set. The tiebreaker was all Galfi, with Di Lorenzo winning the first point, but Galfi taking the next seven to earn her first appearance in a junior slam singles final. "I'm really excited to play the final," said Galfi, who won the Wimbledon girls doubles title with Stollar in July. "It's an amazing feeling to play in the final." 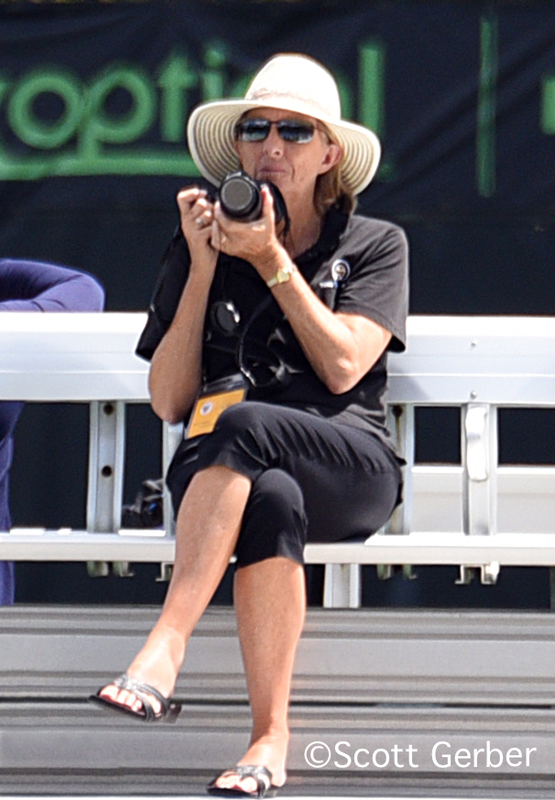 Galfi has recently begun working with former WTA Top 10 player Andrea Temesvari of Hungary, who is in New York and vocally supporting Galfi on the sidelines. "I think I'm more calm and cool on the court, not so frustrated about things happening around me," the 17-year-old said. "She's helped me mentally a lot. She can tell me what to do on court and off court." While Kenin and Galfi will both be making their first appearance in a junior slam final, Tommy Paul and Taylor Fritz are repeating their encounter in the French Open final back in June, with Paul winning that 7-6(4), 2-6, 6-2. Both looked impressive in their semifinal victories, with Paul rolling past Australian qualifier Alex De Minaur 6-0, 6-0 in 42 minutes, and Fritz topping No. 11 seed Yunseong Chung of Korea 6-2, 6-3 in 54 minutes. "He came out and I don't think it was his best day," Paul said of the 16-year-old De Minaur. "He wasn't playing too well, so I tried to take advantage of that from the start. I had an on day and didn't miss too many balls. I tried to win every long rally to try to get his confidence even lower, and I tried to keep running with that." Fritz served nine aces and had at least four serves clocked over 130 mph on Court 17's speed gun, including one in the first game of the second set that read 138. But hitting big serves is secondary to his goal of a winning a junior slam. "Reilly(Opelka) got a 141, and it would be nice if I could match him, but I'm not going to be going for those kind of serves in the final," Fritz said. "I'm going to try to do what I need to do to win." Paul considers clay his best surface, while Fritz puts it behind grass and hard courts in his preferences. "It's his better surface, so it should be interesting to get out there," said Paul. "We both know each other's game. I know he's going to come out and play hard, try to push me back, and I've got to be able to absorb his ball and stay in long points with him. It's going to be tough, but it should be fun." The all-American final is the first at the US Open since 2010, when Jack Sock defeated Denis Kudla. The girls doubles final was scheduled for Saturday, and it did finish, but indoors, due to late afternoon rain that continued throughout the evening. Viktoria Kuzmova of Slovakia and Aleksandra Pospelova of Russia trailed the Russian team of Anna Kalinskaya and Anastasia Potapova 5-2 when play was suspended, but after the match was moved indoors they won five straight games to take the first set, and kept right on rolling to a 7-5, 6-2 win. "I think the rain helped us," said Kuzmova, who had not played with Pospelova before this tournament. "We just tried to forget about the score and focus on every single ball and it worked out." "We were surprised, we played great the whole tournament," Kuzmova said. "We are really solid from the baseline and good in volleys. I actually played some of my best doubles here, so we played really good." The boys doubles final, between the Canadian team of Denis Shapovalov and Felix Auger Aliassime and the American team of Brandon Holt and Riley Smith, is scheduled for Sunday. The singles finals are both second on, on Courts 17 and 5, making it impossible for spectators to watch both. The American Collegiate Invitational was also finished inside, with No. 2 seed Robin Anderson defeating Chanelle Van Nguyen 6-4, 6-4. Anderson led 6-4, 0-1 when rain suspended the final, and she won the first three games played indoors, but Van Nguyen fought back, taking a 4-3 lead. Anderson saved a break point to hold for 4-4, broke Van Nguyen at love, and served out the match, ending it with a huge serve. Anderson had had difficulty closing out her semifinal match with Julia Jones on Friday, so she was happy to have no such difficulty Saturday night. "I was really, really nervous yesterday when I got up, so I definitely didn't want that to snowball and happen again," said Anderson, who graduated this spring from UCLA. 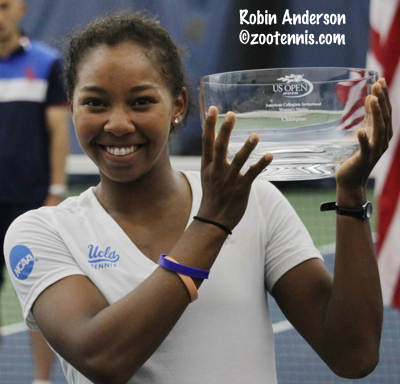 "I knew if I could serve well and close that out at the end, everything would be ok."
Anderson, who won the USTA/ITA Indoor Intercollegiate Championships at the same facility, felt her serve was an asset when the match resumed indoors. "Chanelle was serving really, really well outside," Anderson said of her former teammate. "But I feel like once we moved inside, I had a little bit of the advantage with the serve." Anderson receives a qualifying wild card for the US Open next year with her victory, and she is looking forward to coming back again. "I've been coming here every year since I can remember, except for maybe last year, when I had summer school," Anderson said. "So to be able to come and play with the pros that I see on TV, I think that's great." Van Nguyen, who was an alternate into the event, felt her preparation might not have been ideal, but was happy with her performance during the event. "I played well and I'm happy I got to the finals," said Van Nguyen, who has completed her eligibility at UCLA, but has not yet graduated. "It was an awesome experience to be in this event." 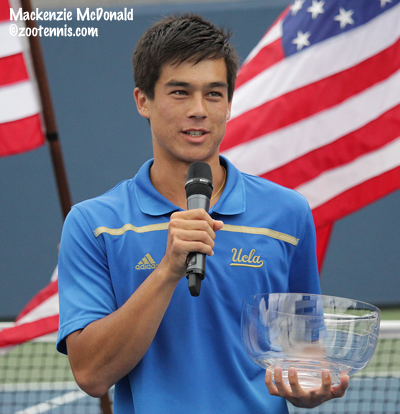 The men's final did finish before the rain set in, with UCLA junior Mackenzie McDonald, the No. 2 seed, taking a 6-2, 7-5 decision from No. 4 seed Gonzales Austin, a recent Vanderbilt graduate. McDonald made 76 percent of his first serves and faced only one break point in the match. "I was really happy with how I served today," said the 20-year-old McDonald. "That's the biggest thing I worked on when I went home, my serve, and I changed some things. My back doesn't hurt now when I serve. I didn't see my percentage, but I think I served a really high first serve percentage. I'm extremely happy about that." Austin agreed McDonald's serve was too good today. "He served really well," Austin said. "I had one break point, the only one I think and he played a solid point, made a first serve and a big forehand. I can't go back and say I regret anything from the match, because I think he just played really well, and there's some things I need to improve on." McDonald is glad to have the opportunity to return to the US Open next year, knowing he has earned a qualifying wild card. "It's really cool that we have this event now here at the Open," said McDonald. "It takes a good amount of pressure off. I'm extremely excited I can come back and play the pros next year. That does mean a lot to me."